Under the Trump administration’s new Remain in Mexico policy, more than 200 asylum seekers have been sent back to Mexico by the Department of Homeland Security (DHS) to wait for weeks or longer until their U.S. asylum determination hearings take place. Implemented through a process formally called Migrant Protection Protocols (MPP), this is potentially the most far-reaching of the administration’s policies to deter sharply rising flows of migrants from the Northern Triangle of Central America (El Salvador, Guatemala, and Honduras). And unlike the administration’s other attempted deterrence policies, this one is extraordinary in its active involvement of a sovereign foreign power. Remain in Mexico has striking similarities to a U.S. policy of the 1980s and early 1990s that turned back large flows of Haitian migrants attempting to seek asylum in the United States, though it has important differences as well. Both then and now, the policies, which were implemented at a time of U.S. government doubt about the veracity of many of the asylum claims, focused on keeping migrants from entering the United States, applying for asylum, and staying in the United States while the asylum claim is being adjudicated. Initially pitched as a bilateral agreement that the United States and Mexico were working to finalize, Remain in Mexico evolved into the MPP policy that DHS established and Mexico has, for now, agreed to allow even as the policy has met with differing levels of support within various Mexican government agencies. MPP (see Box 1) comes on the heels of two other policies the Trump administration has adopted to address the arrivals of migrants from the Northern Triangle: the family separation policy of spring 2018 and the November 2018 presidential decree seeking to ban those who cross the Southwest border illegally from applying for asylum. However, unlike the family separation policy, Remain in Mexico has not generated much public outrage in the United States. And although advocacy groups have sued, the policy was not immediately blocked by the courts, although a U.S. district judge in California will soon decide whether to issue a preliminary injunction pausing the policy. Box 1. How Do the Migrant Protection Protocols Work? Migrants from countries other than Mexico—except for unaccompanied children—who arrive and seek to make an asylum claim at certain official ports of entry on the Southwest border or who enter the country illegally and seek out Border Patrol officials to make an asylum claim may be processed under the Department of Homeland Security’s Migrant Protection Protocols (MPP). Instead of getting an initial credible-fear determination in their asylum claim (which allows successful applicants entry into the United States pending a full hearing on the merits of their claim), the migrant is given a Notice to Appear (NTA) in immigration court in 45 days, where he or she can formally file an asylum application during the removal proceeding, and then is returned to Mexico to await the court date. The Mexican government will accept migrants who already have humanitarian visas that allow them to live and work in Mexico for a year or, if they do not have such a visa, will issue them a separate migration document, which allows them to enter Mexico legally but not to work lawfully. In 45 days, the migrant returns to the designated port of entry and is taken into custody by U.S. Immigration and Customs Enforcement (ICE) for transportation to the initial hearing before the immigration court. During the hearing the migrant has the opportunity to express his or her intent to apply for asylum. The judge will then schedule the case for another status hearing or a full hearing on the merits to adjudicate the asylum claim. The migrant again waits in Mexico for the next hearing. Upon completion of the merits hearing, if the judge grants asylum, the asylum seeker will remain in the United States. If not, ICE will transport him or her back to the port of entry for return to Mexico. For asylum seekers who claim they would face persecution in Mexico if returned under MPP, the process is different. The asylum seeker must affirmatively express the fear of persecution in Mexico, without being asked by U.S. Customs and Border Protection (CBP) officers at the port of entry. The migrant is referred to a U.S. Citizenship and Immigration Services (USCIS) asylum officer, who will administer an “MPP assessment”—an interview during which the officer must determine whether the migrant is “more likely than not” to face persecution in Mexico. A supervisor reviews the decision. If the migrant passes the MPP assessment, CBP will not send him or her back to Mexico, and will instead process him or her for a new disposition, likely placing the migrant in expedited removal (where he or she can then claim asylum as a defense against removal again), or giving the migrant an NTA and releasing them. MPP was first implemented only for migrants who arrived at the San Ysidro port of entry in California, but it is being expanded across the Southwest border. In mid-March 2019, DHS began to apply MPP to the Calexico port of entry, also in California, and the El Paso port of entry in Texas. More importantly, it has been extended to some migrants who crossed the border illegally in the San Diego Border Patrol sector, rather than presenting themselves at a port of entry. The administration has pointed to surging numbers of migrants arriving at the Southwest border in recent months—which U.S. Customs and Border Protection (CBP) Commissioner Kevin McAleenan said Wednesday has pushed the immigration enforcement system to “the breaking point”—to justify the implementation and expansion of the policy. Since fiscal year (FY) 2006, the total number of people apprehended illegally crossing the Southwest border—a proxy measure for illegal migration flows—has trended downward, and from FYs 2010 to 2018, reached lows not seen since the early 1970s. However, apprehensions have risen sharply since August 2018, largely driven by an increase in parents with children crossing the border, often seeking out Border Patrol agents to ask for asylum. Doing so typically allows them to stay in the United States for years, and eventually obtain work authorization, while their claim works its way through the 855,000-case immigration court backlog. The number of family members apprehended crossing illegally per month quadrupled from July 2018 to February 2019, rising from 9,000 such apprehensions to 36,000. During a visit to El Paso on Wednesday, McAleenan said his agency is so swamped by the arrivals that agents are releasing migrants into the U.S. interior without first turning them over to U.S. Immigration and Customs Enforcement (ICE) for that agency to decide whether to detain them or to release them, often with ankle bracelets to monitor their movements. Under MPP, the number of migrants being returned currently is relatively small, but as DHS expands the policy more broadly and can successfully return more people to Mexico from other border locations, Remain in Mexico may become the administration’s new model for dealing with the growing migrant flows. Depending on the results of litigation challenging the policy, the Mexican government’s continued willingness to accept migrants turned back from the United States, and the absence of a strong public reaction in the United States and Mexico, Remain in Mexico has the potential to become a powerful deterrent. Remain in Mexico has strong similarities to the policies three successive U.S. administrations employed to deal with thousands of Haitian migrants who took to the sea during the 1980s and 1990s to flee their country due to economic and political instability caused by the rise and fall of the Duvalier dictatorship and subsequent coups d’etat. Similar to current flows of Central Americans, many of the Haitian migrants sought asylum, and the U.S. government doubted the legitimacy of their claims. Then, as now, the asylum system was overwhelmed. In response to the perceived crisis, in 1981 President Ronald Reagan directed the U.S. Coast Guard to interdict boats carrying Haitian migrants outside of U.S. territorial waters and return them to Haiti. The policy allowed Haitians who expressed a fear of returning to Haiti to have an initial asylum screening interview on board Coast Guard ships. That determined whether they would be repatriated or taken to the United States to apply for asylum. 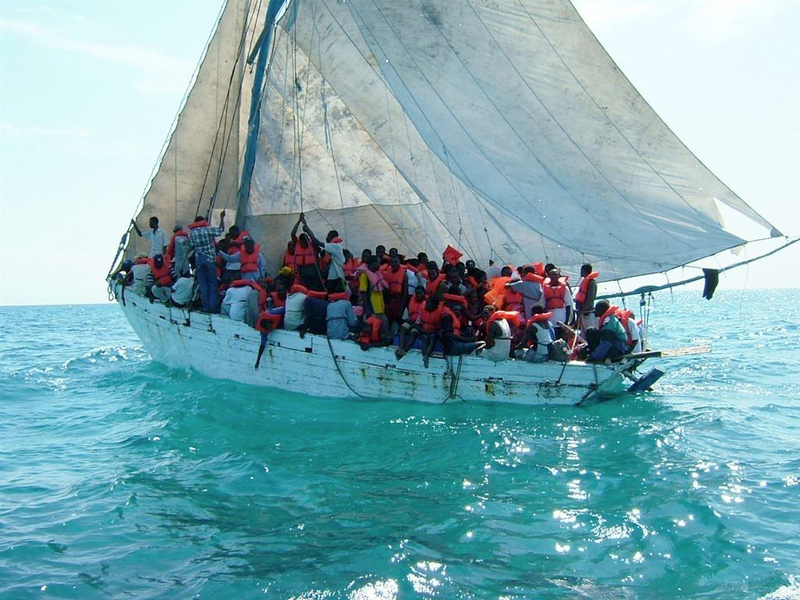 The Haitian interdiction program proved to be a significant deterrent in the 1980s: just 171 Haitians were interdicted at sea in 1982, a trickle compared to the 1,000 unauthorized arrivals that were occurring monthly in Miami a year earlier. Interdictions rose again after a military coup in Haiti in late September 1991: there were 157 Haitians interdicted in September, 68 in October, but 6,159 in November. Subsequently, President George H.W. Bush’s administration began sending all interdicted Haitians to the U.S. naval base at Guantanamo Bay in Cuba, where they underwent credible-fear screenings for their asylum claim. By May 1992, though, the administration believed the policy had led to increased migration. That month, President Bush issued an executive order directing the Coast Guard to repatriate, without the possibility of applying for asylum or getting a credible-fear interview, all migrants interdicted outside of U.S. territorial waters. Interdictions at sea plummeted from 38,000 in 1992 to 4,000 in 1993, though they surged briefly in 1994 when the Clinton administration for several weeks allowed migrants to undergo full asylum assessments on Coast Guard ships and in third countries. The Clinton administration in 1994 ended the blanket ban on access to asylum that was put in place by the Bush administration’s May 1992 executive order, opening the option of “safe haven” for Haitians at Guantanamo Bay while their asylum applications were being adjudicated. Some of the Haitians in Guantanamo were eventually resettled regionally in Latin America and the Caribbean as refugees, though none were allowed into the United States; others either voluntarily returned or were sent back involuntarily to Haiti. A 1991 lawsuit that was brought before the Bush administration further restricted asylum for Haitians in 1992 makes clear the parallels between the earlier interdiction policy and today’s Remain in Mexico plan. Haitian Refugee Center, Inc v. Baker alleged that the screening procedures employed on board Coast Guard ships were not adequate to protect asylum seekers from being returned to a country where their life or freedom was threatened, thereby violating the Refugee Protocol of 1967, which prohibits refoulement (or return) under such conditions. The lawsuit’s central argument, and the claims of insufficient screenings, echo the ones put forth in Innovation Law Lab v. Nielsen, which challenges the Remain in Mexico policy. The current lawsuit, filed in federal court in California on February 14, 2019, challenges the legality of returning third-country nationals to Mexico and the Trump administration’s implementation process, and also claims that the MPP assessment to determine whether someone is likely to experience persecution in Mexico does not provide adequate protection against refoulement, in violation of the 1967 Refugee Protocol and the U.S. statutory implementation of the Protocol. Interviews conducted were often as short as five minutes; they were not conducted in private and they were otherwise insufficient as the Haitians on the interdicted vessels had often been deprived of food and water and were physically and mentally incapable of taking part in an effective interview. The Innovation Law Lab plaintiffs claim that migrants subject to MPP assessments have been given insufficient food, no rest period to prepare for their interviews, receive cursory interviews (as short as five minutes), and most have not been asked about their fear of persecution in Mexico. The difference between the arguments in the two cases is that the 2019 plaintiffs can make the claim that the government is violating a U.S. statute: the one implementing the Refugee Protocol, while in the 1991 lawsuit the courts found that the plaintiffs could not rely on this statute, since the credible-fear screenings were conducted outside U.S. territory and thus fell outside its scope. While a federal district court in Florida found the Haitian Refugee Center plaintiffs were likely to succeed on their claim that the shipboard screening interviews violated the Refugee Protocol itself, the 11th U.S. Circuit Court of Appeals reversed that decision, finding that the Protocol itself did not give the migrants any rights in the absence of an applicable implementing statute. The Supreme Court declined to hear an appeal. One lawsuit that eventually reached the Supreme Court (Haitian Centers Council v. Sale) was filed in March 1992 and amended after President George H.W. Bush issued the executive order directing repatriation of all Haitian migrants. The plaintiffs, in an argument ultimately rejected by the Supreme Court, argued that the executive order violated the same law that the 11th Circuit in 1991 found did not apply to those outside U.S. territory. The policy of blanket repatriations was thus allowed to continue. On first impression, it would seem obvious that the plaintiffs challenging the Remain in Mexico policy would simply point out that the Haitian litigation precedent applies only to those interdicted outside the United States, and therefore the policy cannot be applied to migrants who have reached U.S. territory, as those subject to MPP have. However, between the early 1990s and 2019 there was an important change to U.S. law that the Trump administration has used to justify Remain in Mexico. Section 235(b)(2)(C) was added to the Immigration and Nationality Act in 1996, allowing the United States to return noncitizens who are ineligible for admission and arrive on land from a contiguous country back to that country—in most cases, Mexico. Despite the introduction of this new statutory provision in 1996, plaintiffs in the Remain in Mexico litigation argue that it was not intended to apply to the subgroup of asylum seekers who have been processed for expedited removal. Whether they will prevail in that argument remains to be seen. However, the argument that the MPP assessments provide insufficient protection against unlawful return may be more persuasive. This very argument was convincing to a federal judge in 1991 and was overruled only due to the territorial limits of a U.S. law. After all, Remain in Mexico is not being conducted on the high seas; it is happening on U.S. territory, where application of statutory standards will be stricter. Unless the Remain in Mexico policy is halted temporarily or permanently by the courts, the question becomes whether it will effectively deter unwanted arrivals from Central America. The Trump administration’s other policies with similar goals—such as family separation and the asylum ban—have yet to prove effective. In fact, the start-stop nature of their implementation may well have played a part in increasing flows. It was only in August 2018, about a month after the much-criticized family separation policy was ended in late June, that apprehensions of Central American families arriving at the border began to surge. Rapidly issued court injunctions against the earlier policies combined with intimations of future border security plans, such as construction of a wall, perhaps have created a perception that migrants should cross into the United States while they can, before the next restrictive policy comes down. Remain in Mexico is in a different category of U.S. responses. It is no less restrictive than the earlier policies, but has been implemented gradually, with less visibility, and still allows some access to asylum procedures. So far, those asylum seekers who are affected have been largely out of sight. As of mid-March, just 240 migrants had thus far been returned to Mexico and apprehensions of families remained at record highs, so there is not yet evidence of deterrence. However, if DHS successfully expands MPP across the U.S.-Mexico border, migrants may reassess their options. The new policy will mean prolonged stays in Mexico, with considerable danger to would-be asylum seekers and their families, with a minimal expectation of success in their asylum claims in the United States. Limiting or cutting off access to the U.S. asylum system, as the Haitian case demonstrated, can be powerful. From the U.S. standpoint, the near-term future of the MPP policy will be determined by the outcome of the Innovation Law Lab lawsuit. The Mexican context is more complicated. The Mexican government appears, for now, to be acceding to the United States’ demands. Media reports suggest that President Andrés Manuel López Obrador has accurately assessed that Mexicans are more focused on other domestic priorities, and he, too, has other priorities in his relationship with the Trump administration. López Obrador, who assumed office on December 1, 2018, maintains an 80 percent approval rating that so far has been unaffected by taking back Central Americans returned from the U.S. border. However, if the United States expands the program significantly—which it has already started to do and plans to continue—and the local governments and residents of Mexican border communities struggle even more with their capacity to shelter migrants, and anti-migrant sentiment builds, López Obrador could see his approval rating affected. The policy could then become more costly politically for his administration. In other words, what would make the policy an effective deterrent from the U.S. point of view may make it unsustainable from Mexico’s. House Democrats Introduce New Legalization Bill for DREAMers and TPS Holders. The American Dream and Promise Act of 2019, introduced March 12 by Democratic Reps. Lucille Roybal-Allard (CA), Yvette Clarke (NY), and Nydia Velazquez (NY), would offer legal status and a potential pathway to citizenship to what the Migration Policy Institute (MPI) estimates would be as many as 2.6 million immigrants who are currently unauthorized or vulnerable to removal from the United States. Beneficiaries would include DREAMers, unauthorized immigrants brought to the United States as children; people from 12 countries who are currently or were eligible for Temporary Protected Status (TPS); and Liberians who received Deferred Enforced Departure (DED). DREAMers eligible for conditional residence (the first step in the pathway to citizenship laid out in the bill) would have to have been present in the United States for at least four years prior to enactment of the legislation, have entered when they were under age 18, and meet basic educational requirements. To get legal permanent residence (a green card), they would need to meet further education requirements, serve in the military, or have consistent employment. People eligible for a green card under the TPS and DED provisions would have to have been eligible for one of those protections in September 2016 and have been in the country for at least three years. The bill’s provisions also would apply to certain DREAMers deported since President Trump took office and TPS holders deported since September 25, 2016. Support for the bill remains limited to Democrats—204 of them had signed on as sponsors when it was introduced. Republicans who have supported protections for DREAMers in the past have yet to express support. Supreme Court Upholds Mandatory Detention for Certain Removable Immigrants. In a 5-4 decision on March 19, the Supreme Court ruled that lawful permanent residents with criminal convictions that make them removable can be detained by ICE without the possibility of release on bond, regardless of how much time has passed since they completed their sentence or paid the required fine for their criminal offense. The decision reversed a ruling by the Ninth U.S. Circuit Court of Appeals, which had previously ruled that these immigrants could be held indefinitely in immigration detention only if federal immigration authorities arrested them promptly after they were released in their criminal case. Justice Samuel Alito wrote the majority opinion, joined by Justices John Roberts, Clarence Thomas, Neil Gorsuch, and Brett Kavanaugh. In his dissent, in which he was joined by Justices Ruth Bader Ginsburg, Sonia Sotomayor, and Elena Kagan, Justice Stephen Breyer argued that the majority opinion gave the federal government too much power to deny bail hearings. Congress Rejects President’s National Emergency Declaration. Both chambers of Congress passed a resolution of disapproval that would terminate the president’s national emergency declaration permitting the reprogramming of funds for construction of border fencing. The House vote was nominally bipartisan, with 13 Republicans joining all Democrats in voting for the resolution. In the Senate, 12 Republicans broke ranks with the president. However, on March 15 Trump vetoed the resolution of disapproval, and the House failed to override the veto. Appeals Court Rules that Asylum Seekers Can Appeal Credible-Fear Decisions to Federal Court. A three-judge panel of the Ninth U.S. Circuit Court of Appeals ruled March 7 that asylum seekers who believe the procedures or legal standards applied in their credible-fear interviews were inadequate may appeal to a federal court. This decision applies only to cases arising in the Ninth Circuit, which includes Alaska, Arizona, California, Guam, Hawaii, Idaho, Montana, Nevada, the Northern Mariana Islands, Oregon, and Washington. Previously, noncitizens whom asylum officers judged not to have a credible fear of persecution if returned to their country of origin could have the case reviewed (usually cursorily) only by an immigration judge. DHS and Census Bureau Work on Information-Sharing Agreement. The Department of Homeland Security (DHS) and the Census Bureau have been working since January on an agreement that would allow DHS to share personal data about noncitizens with the Census Bureau, including their immigration status. The Census Bureau chief scientist in January 2018 recommended that instead of asking about respondents’ citizenship status on the census questionnaire, the Bureau should use such administrative data to determine citizenship, as it would yield more accurate results. However, the prospect of the new agreement has concerned some privacy and immigrant advocates. Proponents note, however, that the information stream would go in one direction: from DHS to Census, and that the Census Bureau is not permitted under current law to share information back with DHS. Administration Requests Higher Funding Levels for Immigration Agencies in FY 2020. The president released his fiscal year (FY) 2020 budget request on March 11, including proposals for a variety of spending increases for immigration agencies. Trump requested $8.6 billion to construct additional border barriers, with $5 billion going to DHS and $3.6 billion to the Department of Defense. The budget would also provide funds to hire 1,000 additional Immigration and Customs Enforcement (ICE) officers and 750 more Border Patrol agents. The Border Patrol is currently authorized to employ 21,370 agents; at the end of FY 2018, it was employing 1,800 fewer than that. The budget would also fund 170 more Customs and Border Protection (CBP) officers, who work at official ports of entry. The request seeks to significantly increase detention capacity to 54,000 detention beds, an expansion of about 9,000 beds over FY 2019 funding. It also includes the capacity to monitor 120,000 noncitizens through alternatives to detention, an increase of 20,000 over FY 2019 funding. In addition, the budget proposal would mandate E-Verify nationwide, and would prohibit states and localities from restricting compliance with ICE detainers. While the president’s budget will not pass Congress–every White House budget plan is routinely declared “dead on arrival”–it demonstrates the administration’s funding and policy priorities. Family Separation Lawsuit Class Expanded. U.S. District Judge Dana Sabraw in Southern California on March 8 agreed to consider whether thousands more children and parents who were separated at the Southwest border would be eligible for legal relief. He allowed the plaintiffs to expand their class in the lawsuit, Ms. L v. ICE, to include families separated since July 2017, who may not have been in government custody on June 26, 2018 when he ordered that all separated children in government custody be reunited with their parents. The judge’s decision followed a Department of Health and Human Services (HHS) Inspector General report that confirmed media reporting that DHS had started separating families prior to the announcement of the policy in May 2018. Judge Rules that Administration Must Process Central American Minors’ Parole Applications. On February 28, a U.S. magistrate judge in Northern California ordered DHS to continue processing the cases of 2,714 Central American minors who had been conditionally approved to be paroled into the United States under the Central American Minors (CAM) program when it was terminated in 2017. Their conditional approvals were terminated at the same time. While the judge did not order DHS to let all these minors into the country, she did require that DHS process their cases in good faith, under the same procedures that would have been used before the program was ended. The judge declined to issue an injunction restoring the CAM program. The Obama administration program allowed minors in El Salvador, Guatemala, and Honduras with a lawfully present parent in the United States to apply for refugee status while in their home country and, if they were either approved for refugee status or granted parole, join their parent in the United States. DHS Extends TPS Designation for South Sudan and for Six Countries Covered by Court Cases. DHS has recently ensured that tens of thousands of noncitizens will maintain work authorization and protection from deportation under Temporary Protected Status (TPS). On March 1, DHS agreed to continue to comply with a federal court order that prevents it from terminating TPS for El Salvador, Haiti, Nicaragua, and Sudan until the lawsuit challenging those terminations, Ramos v. Nielsen, is resolved. Nationals of those four countries will continue to have their protections extended for nine-month intervals, or until 120 days after a final, non-appealable decision is issued in the lawsuit. Homeland Security Secretary Kirstjen Nielsen announced on March 8 that she would extend TPS for nationals of South Sudan who have been in the United States since January 2016, covering an estimated 84 people. South Sudan is one of the four countries for which DHS has allowed TPS to continue. DHS then agreed on March 12 to postpone the terminations of TPS for Hondurans and Nepalese—about 66,000 people—until the lawsuit challenging the terminations of the protections for four other countries is resolved. “Second Amendment Sanctuary Cities” Model Themselves After Immigration Enforcement Sanctuaries. In at least four Democratic states that have passed gun-control laws—such as “red-flag” laws allowing law enforcement or family members to ask a judge to take firearms away from someone endangering himself or others, or raising the age for legal gun purchases—county sheriffs are refusing to enforce them, claiming to protect the rights of gun owners in the same way that some “sanctuary” cities believe they are protecting unauthorized immigrants from immigration enforcement. Reuters found that sheriffs in half the counties in Washington state have pledged not to enforce widely supported gun-safety measures. In Illinois, 63 localities have passed a “gun-sanctuary” resolution, and 25 of 33 counties in New Mexico have adopted resolutions pledging to support their sheriffs in not enforcing any gun laws the sheriffs think are unconstitutional. In Oregon, eight counties are allowing their sheriffs to decide which guns laws to enforce. No legal challenges have been raised, at this writing.